Americans are not particularly fond of paying taxes. A poll conducted by Gallup, for instance, found that a 63 percent majority of U.S. adults are dissatisfied with the amount of money they have to pay in federal taxes. Unsurprisingly, various measures of consumer sentiment have improved considerably since the election due in part to the anticipation of tax reform under the new administration. In fact, a quarter of Americans recently surveyed by Bankrate reported that they expect the results of the election to have a positive impact on their personal finances, among which 35 percent believe the benefits will result from reduced tax liabilities. Americans’ general dislike of paying taxes likely also explains why so many people will try to use every tool at their disposal to help shelter their hard-earned money from Uncle Sam. One of the most popular ways of doing this is to utilize a 401(k) plan, a widely accessible retirement savings vehicle with numerous tax advantages. Using a 401(k) does not mean that taxes will never have to be paid but doing so can provide the participant with a lot more control over when taxes are paid and at what taxation level. For example, taxes are deferred on the investment earnings generated in a traditional, SIMPLE, or Safe Harbor 401(k). This enables participants to better capitalize on the power of compound growth (more earnings to be reinvested before taxes are ever paid). Further, traditional 401(k)s enable investors to reduce their end-of-year tax liability, as well as their periodic tax withholdings. In these scenarios, workers participating in a traditional 401(k) plan set aside a portion of their wages before any federal and state income taxes are withheld, and the money pulled from their take-home pay and put into a 401(k) will effectively lower their taxable income for that year. Many Americans will also have a lower income once they retire. Since this would put them into a lower tax bracket than when they were fully-employed, the earnings from their tax-deferred 401(k) plan during retirement could wind up being taxed at a much more favorable rate. For those savers who anticipate being in a higher tax bracket later in life, though, a Roth 401(k) is often considered a better option because these plans allow participants to potentially reduce their post-retirement tax liability through paying taxes as they contribute rather than when they start to make withdrawals. To put this another way, Roth-style accounts provide a way to lock in current tax rates and hedge against an unexpected tax rate spike, a growing risk should the fiscal strains associated with Social Security and Medicare continue unabated. 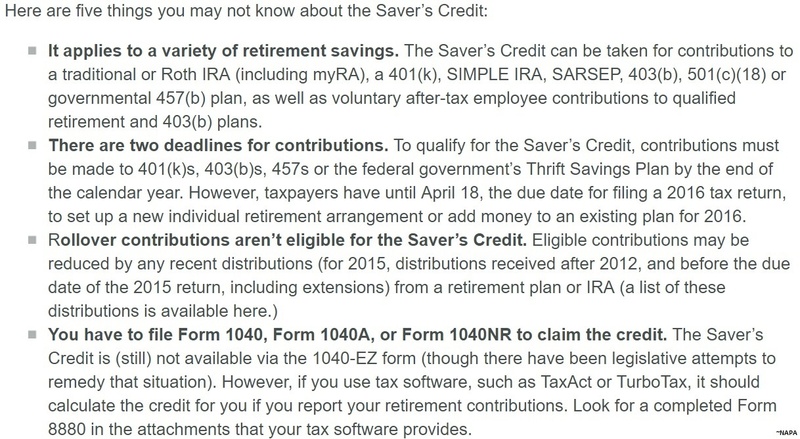 Another tax-related incentive of 401(k)s (and a variety of other qualifying retirement plan contributions) is the Saver’s Credit, a special tax break available to many low- and moderate-income taxpayers. The amount of the credit is 50%, 20% or 10% of a given year’s retirement plan contributions up to $2,000 ($4,000 if married and filing jointly), based on the adjusted gross income reported on your Form 1040 or 1040A. However, a Transamerica Center for Retirement Studies report revealed that just one in four U.S. households with annual incomes less than $50,000 are even aware of this tax break. Transamerica president Catherine Collinson added that “The Saver’s Credit is a tax credit above and beyond the advantage of tax-deferred savings when contributing to a 401(k), 403(b), or IRA. Because this double benefit sounds too good to be true, many eligible savers may be actually confusing the two incentives.” Employers can do more to help boost awareness of the Saver’s Credit, especially since a recent poll conducted by the National Association of Plan Advisors (NAPA) found that only about a third (31 percent) of surveyed plan sponsors said that they regularly mention or promote the Saver’s Credit in their plan communications.